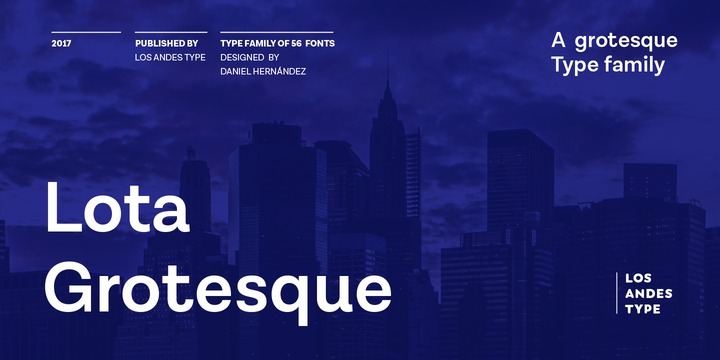 Lota Grotesque is a grotesque typeface created by Daniel Hernández and published by Los Andes which is available in 56 styles, 7 weights and italics, multiple stylistic alternates and combinations. Also it has multilingual support. This versatile font it works great on branding, logo, display, magazine and so on. Enjoy! Price: starting from $29,00 for one font to $289,00 far all 56 fonts. A font description published on Monday, June 12th, 2017 in Daniel Hernández, Fonts, Los Andes by Alexandra that has 3,688 views.